Jose Mourinho's troubles increased in his absence with Chelsea's manager powerless as his Premier League champions slumped to another damaging defeat at Stoke City. Mourinho was forced to watch from Chelsea's team hotel as he served a one-match stadium ban for his behaviour towards match officials in the 2-1 defeat at West Ham United in October. Chelsea's backroom team took charge but were left tasting defeat once more as they lost their seventh game out of 12 in the league this season, to be left in a lowly 16th position by Marko Arnautovic's acrobatic 53rd-minute finish. Mourinho will have been cursing Chelsea's luck as they deserved a point, Pedro hitting a post and Loic Remy stumbling as he went around Stoke City's outstanding keeper Jack Butland - with penalty appeals ignored by referee Anthony Taylor. Butland also saved well from Ramires and Diego Costa, but Stoke's determination and superb defensive organisation won the day in a thunderous atmosphere in The Potteries. Mourinho, who once more received vociferous support from Chelsea's fans throughout, will be back in the technical area for the home game against Norwich City on 21 November - left with a fight to somehow guide his side away from the bottom end of the table. As Mourinho watched events unfold from Chelsea's team hotel, his trusted lieutenants took charge in his absence. Steve Holland was first out into the technical area giving instructions before the combustible Rui Faria took his turn - until the pair were out together directing operations. Little was seen of Silvino Louro, who stayed in his seat while Faria made notes and Holland was seen with his iPad as Chelsea fought to salvage something from the game. With their manager banned from being in attendance, Chelsea played with real attacking verve in the first half without finding the final product and chased an equaliser with real determination. This was not a team lacking effort or seemingly at odds with their manager - this was a game where they deserved a point but were unable to find the moment that made the difference. Mourinho was present in some form as hundreds of Chelsea fans wore masks bearing the image of their manager to compensate for his absence. And, as they did during the Champions League win against Dynamo Kiev, Chelsea's fans made it clear they are still right behind their manager. As the game entered its final seconds, the section of the Britannia housing Chelsea's supporters echoed to Mourinho's name once more. They clearly want "The Special One" to guide them out of this current crisis. Asmir Begovic's presence in Chelsea's goal was proof of just how highly Stoke City manager Mark Hughes rated his deputy Jack Butland. Hughes was comfortable accepting Chelsea's £8m offer for Begovic in the summer because he knew he had a replacement of real quality in the 22-year-old. And, as he has all season, Butland showed exactly why Hughes felt it was time to make him Stoke City's first-choice keeper with another impressive display. Butland showed great agility to stretch to tip over a dipping drive from Ramires in the first half, as well as blocking an angled drive from Diego Costa with his legs. Butland has been given a taste of England action and with friendlies coming up against Spain in Alicante on Friday 13 November and France at Wembley the following Tuesday, he should get a further opportunity to confirm the goalkeeping position behind Joe Hart is in safe hands. Hughes was left mystified as his side made a slow start to the season, but this result means they have only lost once in nine games. Stoke's boss will be eyeing up another top-10 Premier League finish after Chelsea left The Potteries beaten for the second time inside a fortnight, following their defeat on penalties in the Capital One Cup. Backed by fervent support inside one of the Premier League's most atmospheric arenas, Stoke showed trademark determination and resilience to keep Chelsea at bay in the first half before mixing real purpose and defensive solidity to carve out the win. Hughes had a tough act to follow to build on what Tony Pulis left behind at Stoke but now, in his third season, this is very much his team and - the blip of that defeat at home to Watford apart - they are now back to their best. He has added the flourishes of £12m record signing Xherdan Shaqiri to Stoke's concrete-clad willpower and the results are impressive. Chelsea goalkeeper Asmir Begovic: "We definitely did enough to get a result here, but when things aren't going your way you don't get the luck you deserve. "We hit the post, we slipped over when we had open goals, we are making things hard for ourselves." On Mourinho's stadium ban, he added: "Jose did the pre-match talk at the hotel and that was it." Asked if he was concerned that there may be a change from above, Begovic said: "That is out of our hands, we are behind the manager - you can see that from our performances. We think he is the right man and someone we work hard for. Jose Mourinho has lost seven league games in a campaign for the first time as a manager. Marko Arnautovic scored his first league goal at the Britannia Stadium since May 2014 (v Fulham). Only one side in Premier League history has finished in the top six having taken 11 points or fewer from their first 12 games - Aston Villa in 2003/04. The Potters have kept four clean sheets in their last five PL games, having gone eight without one prior to that run. Chelsea host Norwich on 21 November, while Stoke travel to Southampton on the same day. Match ends, Stoke City 1, Chelsea 0. 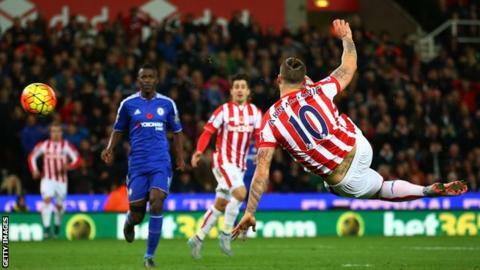 Second Half ends, Stoke City 1, Chelsea 0. Attempt missed. Willian (Chelsea) right footed shot from the right side of the box misses to the left. Assisted by Nemanja Matic. Attempt saved. Oscar (Chelsea) right footed shot from the centre of the box is saved in the centre of the goal. Assisted by Eden Hazard. Glen Johnson (Stoke City) is shown the yellow card. Attempt missed. Loïc Remy (Chelsea) right footed shot from the centre of the box is close, but misses to the right. Assisted by Diego Costa. Attempt missed. Jonathan Walters (Stoke City) right footed shot from the centre of the box is high and wide to the right. Assisted by Mame Biram Diouf. Attempt blocked. Eden Hazard (Chelsea) right footed shot from the centre of the box is blocked. Assisted by Cesc Fàbregas. Attempt blocked. Oscar (Chelsea) left footed shot from outside the box is blocked. Loïc Remy (Chelsea) wins a free kick on the right wing. Attempt blocked. Nemanja Matic (Chelsea) left footed shot from outside the box is blocked. Substitution, Chelsea. Loïc Remy replaces Ramires. Attempt missed. Nemanja Matic (Chelsea) left footed shot from outside the box is too high. Assisted by Willian. Attempt missed. Diego Costa (Chelsea) right footed shot from the centre of the box misses to the right. Substitution, Stoke City. Geoff Cameron replaces Bojan. Substitution, Chelsea. Oscar replaces Baba Rahman. Pedro (Chelsea) hits the left post with a left footed shot from outside the box. Assisted by Willian. Attempt missed. Marko Arnautovic (Stoke City) header from the centre of the box is too high. Assisted by Xherdan Shaqiri with a cross. Attempt missed. Glen Johnson (Stoke City) right footed shot from outside the box is too high. Assisted by Xherdan Shaqiri. Attempt missed. Eden Hazard (Chelsea) left footed shot from outside the box is too high. Assisted by Diego Costa. Corner, Chelsea. Conceded by Philipp Wollscheid. Attempt saved. Nemanja Matic (Chelsea) left footed shot from outside the box is saved in the top centre of the goal.